Norton Creek Press, December 2008, 499 pages. Suggested retail price, $39.95. ISBN 0981928420. As enthralling as any work of fiction, A Thousand Miles up the Nile is the quintessential Victorian travel book. 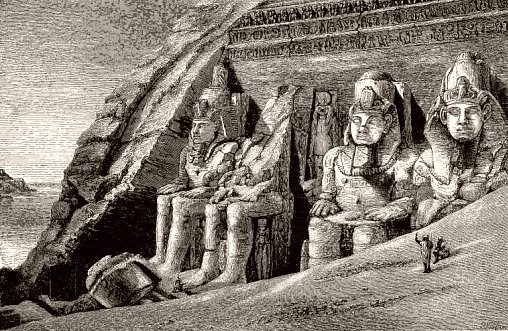 In 1873, Amelia B. Edwards, an upper-class Victorian spinster, spent the winter visiting the then largely unspoiled splendors of ancient Egypt. The Great Rock-Cut Temple, Abou Simbel, Nubia. An accurate and sympathetic observer, Edwards brings nineteenth-century Egypt to life. 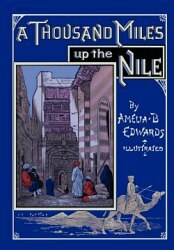 A Thousand Miles up the Nile was an instant hit in 1876, and is received with equal enthusiasm by modern readers. This Norton Creek Press edition of A Thousand Miles up the Nile is a complete, single-volume reproduction of the lavishly illustrated 1890 edition by Routledge and Sons, which routinely sells for over $100. The engravings are not as crisp as in the original, which was a masterpiece of the Victorian printer’s art, but you will be delighted by both the book and its illustrations. Amelia B. Edwards = Amelia Peabody Emerson? Fans of Elizabeth Peters’ Amelia Peabody Emerson mystery novels will be struck by the similarities between the two Amelias. It’s not just their first names, but many of the scenes and major plot elements in Peter’s First Amelia book, Crocodile on the Sandbank, are straight from A Thousand Miles Up the Nile. That means that A Thousand Miles up the Nile is a compelling and detailed sourcebook that provides a wealth of background information, bringing Peters’ excellent books even more vividly to life. Look for more of Edwards’ works from Norton Creek Press. 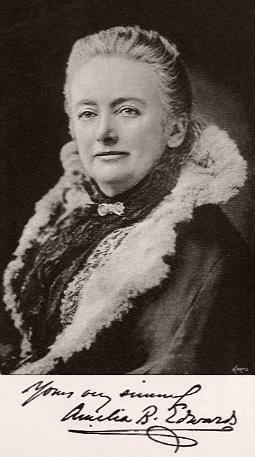 Amelia B. Edwards was an author and co-founder of the Egypt Exploration Fund (now the Egypt Exploration Society in 1882. She wrote a famous book on egyptology (Pharoahs, Fellahs, and Explorers) and translated Gaston Maspero’s book, Manual of Egyptian Archaeology). I recently finished A Thousand Miles Up the Nile. This is one of the most wonderful books I have ever read. I can only imagine what it must have been like to read such a book in 1876! I was very sad when it ended. I wanted another 500 pages. Thank you very much for bringing such a great read to my attention. You can order on Amazon, or see our How to Order page.